A changing table doesn’t necessarily have to serve one purpose; it can be multipurpose. If you’re a parent and hesitant about buying a changing station, not knowing what you will do with it once the diaper days are over, worry not! We are here to help you with our review of a changing station that offers a lot of uses. RUSTIC ELEGANCE: Rustic wood drawer fronts and unique metal drawer pulls make this piece one of a kind! SPACIOUS AND STURDY: A section of the table top provides generous space for creams, powders, or anything you'll need while changing diapers. CUSTOMIZABLE AND VERSATILE: When your child is older and no longer needs a changing table, this easily converts into a storage chest for their bedroom. Available in a white and brown exterior, the South Shore Changing Table comes with a removable changing station. It has three wide drawers and one large section on the right that further contains two sliding shelves convenient enough to hold jars of lotion, wipes, and/or toys. It entails extremely elegant metal handles with a black finish. Once your baby grows up, you can use it as a regular table. Our top 50 of the best changing tables features many more changing table options for you to choose from. You can also check out our review of the Babyletto Lolly 3-Drawer Dresser changing table which is a simple but effective alternative to this changing table. This table has been designed keeping all the safety regulations in mind. Made from a non-toxic laminated board, it is safe to use. The edges have been contoured to avoid mishaps. 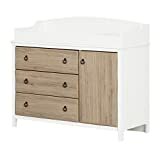 There is also a fully white alternative version to this table called South Shore Candy changing table, which differs from this changing table only in terms of design. Overall, the product has received some great reviews along with some mixed reviews from customers. Where some people complained about the time it required to assemble, others were happy about the two-toned elegant design of the product. If you’re looking for a multi-purpose changing station for your baby, you should definitely give this one a look. Not only does this product come with a removable station, but it also offers extensive space to store all your baby’s products. Once your baby has grown up, the changing table can serve as a regular table in your kid’s room.